For those rooms that are perfect for hosting guests but just slightly small, this versatile 5 piece table set is ideal. The set has five benches that are comfy and on wheels for easy moving. The benches tuck perfectly underneath the round dining table to minimize storage space. The cushions on each bench adds comfort and lift to reveal additional storage. No matter how much your kids may turn the benches into go-carts, they will last for years from their solid wood construction. Invest in some flexible seating with this beautiful wooden table and bench set! This compact square wood table includes five benches for easy storage! This 5 Piece Round Table Bench Set creates a dynamic environment that changes shape and function when you need it to. Each of the four triangular stools have casters to roll perfectly under the circular table. Each stool has storage with the upholstered seat lifting off as a comfortable lid. This round dining table with benches has a trestle base supporting a single pedestal. The four trestles have stylish vertical slats and are the right fit for the stools. The table can remain at sitting height to complement the stools, or can lift to standing height for either a pub or a productive atmosphere. It's heirloom furniture for creative design! Handcrafted material in America made up of 100% solid hardwood. The Amish Arts & Crafts Dining Room Set offers a mission style design, perfect for those who prefer furniture pieces with a touch of elegance. Apart from being durable, family-friendly dining table and seats, leather, fabric, and faux leather seats are also available. With Amish Furniture Factory, get a customized Arts & Crafts Dining Room Set that suit your taste and needs. Available in different high-quality hardwoods such as oak, hard maple, cherry, hickory, walnut, white oak, rustic cherry, rustic hickory, and brown maple. Don't let a corner space go to waste. This nook set includes two benches with a corner piece, all with back rests, a table and an extra backless bench for even more seating. There are storage compartments under the benches and even in the corner seat. The breakfast nook set is great for family meals, working from home or helping the kids out with their homework. The wood of this set can be stained to match your dining room. Natural, simple, and with a touch of elegance, The Amish Baytown Dining Room Chair will fit in almost any settings, thanks to its contemporary vibe with a subtle feel of a mission style furniture. This complete set including a solid wood dining table with chairs offers maximum comfort and various customization selections. The Baytown solid wood dining table set with chairs offers a wide range of options for finishing and table edges. Its chairs provide a deep scoop seat for your comfort. This Amish handcrafted set received precision cut and Old World craftmanship skills to avoid rocking or wobble on the dining room floor. The table features banquet style table top, chamfer edge, 2-inch straight skirt and levelers in fit. On the other hand, the solid hardwood chairs showcase a curved wood back, sturdy wood slats, and a saddle scoop seat. Customize your Baytown Dining Room Set and decide between a number of seat, chair type, finishing and wood types available. Top Diameter: 42" (only takes two leaves), 48", and 54"
Old world Amish furniture's traditional vibe with a glamorous touch. This wonderful set awards extra flamboyance to the ambiance of a dining room. Take advantage of its customizable, handmade pieces! The Amish Broadway Dining Leg Table features a 2½ inches skirt in the center and 3½ inches at the ends. Also, its table features a non-geared wooden slide that saves everyone from worries if they need to adjust the dining area to make room for additional guests and dishes. On the other hand, the supreme woodwork Amish artisans applied to the Broadway Dining Chair creates a perfect and the most convenient wooden seat. Its unmatched quality, style, and durability exactly shows the Amish furniture trademark. Made of nothing but only the finest materials, this makes an excellent heirloom that many generations would treasure. Pictured in a custom two tone finish. Make your Amish Broadway Dining Room Set totally yours! Custom finishes to be ordered by phone. This beautiful nook set includes two benches and a corner piece, a table and an extra backless bench for more seating. The table can fit up to two chairs if you’d rather have individual seats instead of a bench. If you opt for a bench, it will have storage space built into its base. The corner bench also has storage space built in if you opt for chairs. This nook's stylish slats add excitement while the classic wood keeps the nook feeling like home. A nook is a great place to gather family and friends for meals, game night or other family activities. 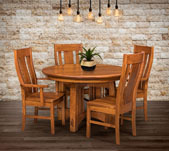 Bring the rustic and homely feel of the Rocky Mountains with the Amish Denver Dining Room Set. This rustic furniture takes you to a country setting with ranch style homes, mountain lodges and cabins in mind. The Denver Dining Room Set fits perfectly in a home aiming to achieve this vibe. The Denver Dining Room Set is available in many wood types. We recommend the rustic cherry or rustic hickory to those who want to bring that Colorado mountain feel in their homes. This solid hardwood set also features chairs with sturdy slats and a mission style appearance. Warm and inviting, this nook set will make any kitchen feel homey. This set includes two benches with a corner piece, a table and an extra backless bench for more spots to stop for a real meal. Cushions add comfort and style for the active, fun-loving family, while the straight Mission-like design stays out of the way of family activities. The benches have storage so your children can stow their toys during meals or you can quickly tuck away work before guests arrive. The corner bench has a leaf in its back which can be utilized for extra storage. - All except the 48" x 72" will self store one 12" leaf with skirt, and one 12" leaf with no skirt. The Amish Marbarry Dining Room Set is definitely not an ordinary piece of furniture. This classic, mission style set features a handcrafted double pedestal base bridged with trestle details. It supports the Marbarry table top, great for serving family gatherings or even a romantic dinner for two. Furthermore, the simple, yet timeless piece of art adapts to any home. The spacious surface of the Amish Marbarry Dining Table can support large meals, parties, and many guests. Those who handcrafted the furniture built the unit with the goal to last a lifetime. Take the opportunity to acquire a smooth and expansive surface by making use of our customization options. Select from a range of dining space accents and wood types. Families will definitely enjoy this so grabe the chance to personalize this amazing piece. Possibilities are indeed endless with Amish Marbarry Dining Room Set! Truly stunning, this nook set is perfect for creating a focal point in your home. This set includes two benches and a corner piece, a table and an extra backless bench for more seating. The table can accommodate up to two chairs lengthwise if you’d rather have chairs instead of a bench. The nook benches even have storage in their seats to tuck away any items you’d like to keep readily on hand for meals. The corner bench has a leaf on the back so there is a shelf for storage or home décor in that hard to utilize corner space. The Mission style details in this set are welcoming and classic with a modern sensibility. Base Size - 16" x 20"
The Shelby dining room table and chair set features an elegant, simple and versatile style. It's round top and tapered legs give it a distinct look that will enhance the look and feel of nearly any dining room. The Shelby dining chairs take after the table design with gracefully swept back feet, tapered legs, and very comfortable ribbed seat back style slats. Four Shelby dining chairs are included in the set in case you want to make way for one or more Shelby bench seats. Add more chairs by using our drop down box for when you want to add leaves and increase the table top size. The Shelby dining room set can be built from several popular hardwoods, and stained in dozens of different colors to match your home and furniture. Width & Length Sizes: 42" x 66", 42" x 72", 48" x 66", and 48" x 72"